I was watching TV a couple days ago and that Allstate commercial with the guy partying mayhem came on. My first thought was, wow what an awesome recurring paying gig to have landed. My second are they any gods out there that represent Mayhem. Because you know, my mind works that way. What happens when I get curious? Google of course. It led me first to the dictionary, which defines Mayhem as the following: needless or willful damage or violence. Then to it took me to Wikipedia for a list of War deities (it is long and varied) and I won’t try to go through all of them here. This list of Gods lead me to search for stories featuring God’s as major characters. 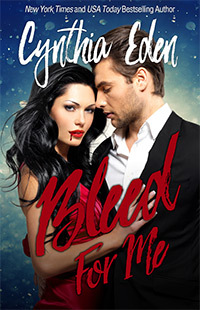 I found, Bleed for me by Cynthia Eden snug in my ereader. It features a Apollo, the Greek God of the sun falls for a vampire. My search to me back to google and led to Goodreads and a discussion of Mythology and Immortals where I found that most books featuring Gods are really descendants of Gods like Elisabeth Naughton’s Marked. Which features Theron a descendant of Hercules. Anyone out there have any suggestions? Do you like Gods as hero’s or Heroines? Or do simply prefer Immortals? ← Beowulf ~ The Original Vampire Slayer? I always thought Loki was a god of chaos; he’s certainly one of trickery, but I’ve not seen the recent film to see if he’s added any characteristics lately. There is Shiva and Kali, the Destroyer/Transformer and the goddess of Time/Death. Is that what you are thinking? I write a series of novels set in 1550BCE Ancient Egypt featuring various gods and goddesses. To date I’ve primarily utilized Sobek the Crocodile God, Renenutet the Snake Goddess, Horus the Falcon and Isis and her sister Nephthys in my plots, along with Lady Ma-at. The concept of Ma’at or universal truth and order was paramount to the Egyptians of that era and something they strove for in every aspect of life. Didn’t always achieve it of course, being human! My heroes and heroines are ordinary warriors, dancers, priestesses, but the gods become directly involved in events. Good topic for a post! I love the Egyption mythos. I can only think they are not as well known as the Greeks and Romans because the were so fluid and changeable from city to city and from one Pharaoh’s rein to the next. I don’t think I’ve read many books where the hero or heroine were gods. They are often in the back ground of book like the Dark Hunter series. In Maria Zannini’s True Believers, the heroine is an immortal and the hero, from another world, believes her to be a lost god from his religion. I thought this was a fun twist. I like gods and goddesses as Hero’s…I don’t know too May books but movies seem to work well. I thought Loki was great in the Thor movies…better than Thor.